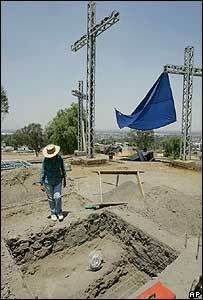 Archaeologists have discovered an ancient pyramid buried under a hill on the outskirts of Mexico City. The pyramid is said to be 1,500 years old and was built by the same ancient people who constructed the Teotihuacan complex, known as the City of the Gods. Parts of the structure have been badly damaged as the hill has been used for decades to stage re-enactments of the crucifixion of Christ during Holy Week. The religious celebration is attended by as many as one million devotees. Measuring 150m (492 feet) on each of its four sides, the 18-metre (59-foot) tall pyramid was carved out on a natural hillside around 500 AD. 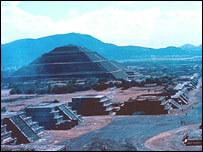 It was abandoned in about 800 AD, when the Teotihuacan culture collapsed for unknown reasons. "When they first saw us digging there, the local people just couldn't believe there was a pyramid," archaeologist Jesus Sanchez said, who has been exploring the site since 2004. It was only when the slopes and shapes of the pyramid, the floors with altars were found, that they finally believed us. The majority of the people now feel happy and proud, and have helped out a lot in protecting the relics," he added. Iztapalapa hillside, known as Hill of the Star, overlooks one of Mexico City's poorest and most dangerous neighbourhoods. Local people began re-enacting the Passion of Christ there in 1833, to give thanks for divine protection during a cholera epidemic - a ritual which now draws as many as a million spectators every year. The site will not be fully explored because it is now considered a religious centre in its own right, said Mr Sanchez of the National Institute of Anthropology and History. "Both the pre-Hispanic structure and the Holy Week rituals are part of our cultural legacy, so we have to look for a way to protect both cultural values."